The Royal Navy's airborne early warning (AEW) capability had been lost when the Fairey Gannet aeroplane was withdrawn after the last of the RN's fleet carriers was decommissioned in 1978. During the Falklands War, a number of warships were lost and casualties suffered due to the lack of an AEW platform. The proposed fleet cover by the RAF Shackleton AEW.2 was too unresponsive and at too great a distance to be practical. Consequently, two Sea King HAS2s were modified in 1982 with the addition of the Thorn-EMI ARI 5930/3 Searchwater radar attached to the fuselage on a swivel arm and protected by an inflatable dome. This allowed the radar to be lowered below the fuselage during flight and for it to be raised for landing. These prototypes, designated HAS2(AEW), were both flying within 11 weeks and deployed with 824 "D" Flight on HMS Illustrious, serving in the Falklands after the cessation of hostilities. A further seven HAS2s were modified to a production standard, known as the AEW2. These entered operational service in 1985, being deployed by 849 Naval Air Squadron. Four Sea King HAS5s were also later converted to AEW role as AEW5s, giving a total of 13 AEW Sea Kings. An upgrade programme, Project Cerberus, resulted in the Sea King AEW fleet being upgraded with a new mission system based around the improved Searchwater 2000AEW radar from 2002 onwards. This variant was initially referred to as the Sea King AEW7, but soon renamed ASaC7 (Airborne Surveillance and Control Mk.7). The main role of the Sea King ASaC7 is detection of low-flying attack aircraft; it also provides interception/attack control and over-the-horizon targeting for surface-launched weapon systems. In comparison to older versions, the new radar enables the ASaC7 to simultaneously track up to 400 targets, instead of an earlier limit of 250 targets. The effectiveness of the AEW7 was greatly increased via the addition of a Link 16 data link, allowing gathered radar information to be analysed and rapidly put to use by multiple allied platforms in range. The ASaC7s will remain in service until they are replaced under the Future Organic Airborne Early Warning (FOAEW) programme, which will operate from the UK's future Queen Elizabeth class aircraft carrier. Prospective replacement aircraft include a similar derivative of the AW101 Merlin, an adaption of the Bell-Boeing V-22 Osprey tilt-rotor, and the fixed-wing E-2 Hawkeye. This is, I believe, the second boxing of a Sea King by Cyber-hobby, the first one being the Commando. As you might expect, there are some sprues the same between the two helicopters, but this one includes several new ones. The largest is for the fuselage halves and the radome with support. I like that Cyber-hobby does not do a 'one fuselage fits all' as is done by other companies. Another different sprue is for the main landing gear/side pontoons. 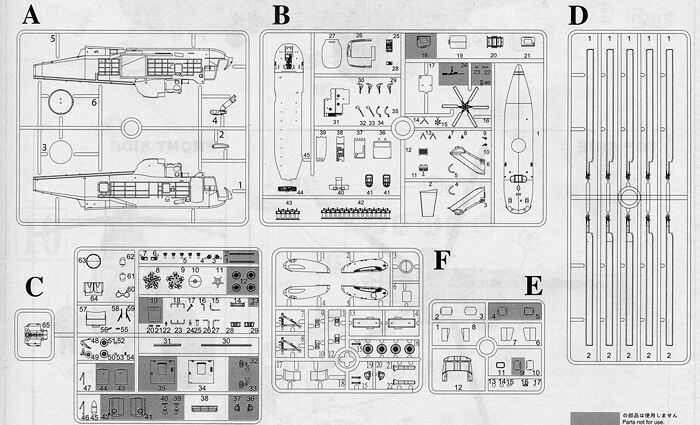 This includes some parts not used and if you look at the parts diagram, you will find other not used bits. The cockpit is well detailed with both the cyclic and collective controlls as well as rudder pedals. A nicely done cabin is provided, but I honestly do not see the AEW operator's position. Instead, you get two rows for standard jump seats. Not sure if this is right or not, especially as the mount for the radome is attached to the main cabin door. Still, there are door slides so perhaps it has been reinforced to handle the additional weight. Speaking of the radome, the only way the instructions show this kit being built is with the radome in the lowered position. No way you can display the model without a stand if you do this. The radome did rotate back 90 degrees when coming in for a landing and when the helo shut down, the inflatable radome deflated. It would have been nice to have had this as an optional part, but I'll bet aftermarket will come to the rescue in this instance. Other items in the kit are a rescue winch, main cabin stairs and a separate door with stairs to access the cockpit area. The tail section is also separate for those who want to show this in a stowed position. I should point out that the kit comes with a six blade tail rotor which looks to be correct from the photos I have seen. Another blade options is that the main rotor blades as they can be displayed either spread out or folded back. As helo rotor blades often take up a lot of shelf space, this option is very much appreciated. Another neat option for the blades is to have them as if they are under load. A separate set is provided for this in the chance you wish to model the aircraft in flight. The kit also comes with all of the various ESM/ECM blisters common for this type. These early AEW helos are in overall light grey and since they all operated with 849 squadron, the difference in the three options is only serial numbers and codes. The box art version does have a small bee marking on the forward fuselage to add a bit of color. Instructions are tyical of Cyber-hobby/dragon and have Gunze and Model Master paint references. Though not in service until after the Falklands War, this one is provided in one of their 30th Anniversary boxings. 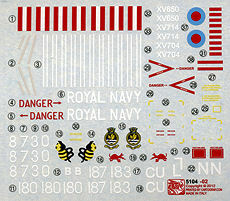 The small decal sheet is well printed and while I cannot vouch for the accuracy of the serials, I would hope that these are correct. 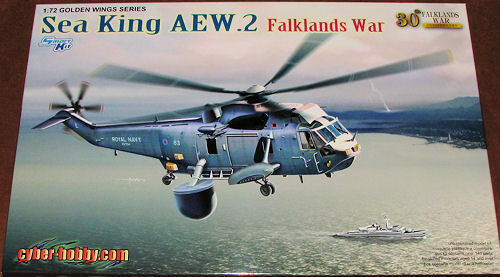 Nice to see another Sea King and I am hoping they do a full series of these, including the US versions. Though slowly leaving service, there are a ton of nice schemes for these and for many of us, these are some of the nicest looking military helos around. Thanks to www.dragonmodelsusa.com for the preview kit. You can get yours at your local hobby shop or on-line retailer.